Does the TPS sensor go by any other names..... i know this sensor regulates fuel cut but does it do anything else? TPS = Turbo pressure sensor. on the st185 it provides a pressure signal to the ECU from which the ECU calculates fuel cut. It also has a separate wire connecting it to the stock boost gauge on the dash board. Appart from these 2 functions it serves no other purpose. There is no pressure sensor based fuel/ignition corrections on an st185 ECU. If you electronically disconnect it from your engine (ie you cut the PIM wire, unplug the sensor wiring harness etc.) the ecu will begin to calculate fuel cut based on the signal from your AFM & throttle position, and when you hit airflow based fuel cut you have to reset your ECU (by pulling a battery terminal). Basically dont do it. It will also (by some means which i have yet to establish) pull ignition timing much more readily with the sensor electronically disconnected. this is for ST165... so im assuming the same is true... i have a real boost guage also so no problem there. got another one for you. InitialD93 wrote: Does the TPS sensor go by any other names..... i know this sensor regulates fuel cut but does it do anything else? Some call it map sensor (manifold air pressure sensor)...i personally don't call it that b/c it doesn't actually determine anything for fuel maps (soley AFM). Also called BPS (boost pressure sensor), and i personally like to call it this b/c TPS just keeps clicking Throttle Position Sensor into my head. MAP = Manifold Absolute Pressure sensor. Dustin I think those other things are for the A/C system, not 100% about it though. I would have to pop my hood and look at it real quick. I looked up the part number on those and, if I remember correctly, they are both for AC. One is a temp sensor and the other is idle up control. I don't remember exactly, but I do remember they don't do anything I care about. where is the turbo pressure sensor located on the 165? The bottom one is the MAP sensor and the top one either is for the powersteering idle up or deals with the ac. I cant remember what it went to its been soo long ago. but i removed mine with my ac. The bottom one, I'm sure, it is turbo pressure sensor. Like Bryan said, everytime I heard TPS, I always think the Throttle Position Sensor. I'd rather call it MAP sensor. Everytime I hear MAP I think 3rd gen and get confused. I think BPS is the only one that won't drive us all crazy. The Turbo pressure sensor on the 165 is located on the firewall on the passenger side, somewhat in the corner. It say Turbo Pressure Sensor right on it, you should see it right away. 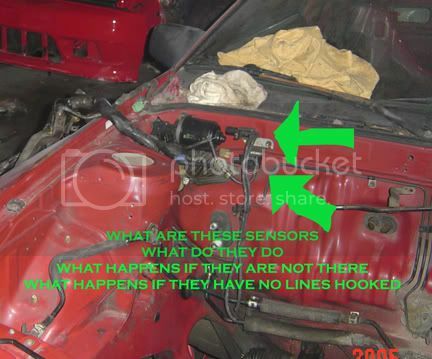 Gary wrote: Like Bryan said, everytime I heard TPS, I always think the Throttle Position Sensor. I'd rather call it MAP sensor. My 1992 Alltrac is for sale again. TPS is also used for trottle position sensor. And the MAP is used a lot for any non turbo s block. pressure sensor to know what's going on with intake air flow. Kind weird how different these very similar engines manage themselves.